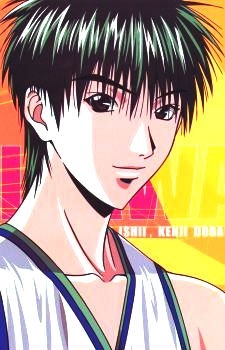 Aikawa - often nicknamed as Aika - is well known as a genius in basketball. Most characters he comes across know of him and his powerful reputation. He transferred from Tendōji High to Mizuho High because he thinks that playing basketball in Tendōji High is not meaningful at all, and that basketball should be about enjoying yourself. He is a second-year student. His father is the head coach of Tendōji High School. Aikawa seems to be romantically involved with Mai Moritaka of the girls' team. He was the one who convinced remaining players to play basketball again. Mutsumi had once said that it was as if Aikawa reminded them all about how much fun they could've all had playing basketball together. He was once the trump card and captain of the Tendōji High's basketball team. He plays the position of small forward in the team. He also has a knack of being able to jump higher than most people, and that makes up for his height disadvantage.